I have run into some difficulty in my latest attempt to run for President. While people have shown overwhelming enthusiasm for my platform, there hasn’t been enough people. While I continue to lead Presidential candidates in the quality of support, it hasn’t turned to the quantity of support (votes). Another problem I am having is that 2016 is a long time away (By 2016, I really mean January 20, 2017 – the day I would take office). It’s a short time to get a quality campaign capable of winning a nationwide election without spending a dime. It’s an eternity for Obama to mess up things more than they already more and making it impossible for anybody (even me) to clean up all of his messes in only four years. A true leader takes matters into his own hands. This is why I have declared myself “King of the United States of America”. I am not going to be a power-hungry king. The only immediate action I am taking as King is to have Canadian Spy Justin Bieber deported to Canada where he belongs. It seems that America is hungry for a King. The news and social networks have been talking about nothing but the birth of a royal baby all day. This royal baby born today isn’t even American royalty. We need American royalty to help fix this country. I am honored to have selected myself to be the first American King. My Campaign Manager does not know this yet, but he is running for U.S. Senate from New Jersey. I have taken the privilege of taking the role of being his campaign manager. The one drawback is that he will be paying his what I have been paying him. My running a penniless campaign has prevented me from paying him. Why am I doing this? The answer is simple: I am going to need help to pass my platform through Congress. The current bunch of characters in Washington are pro-Cinemafia and are not interested in my energy, crime, or any other plans I have to offer. It is important to have people who support my campaign and my positions run for the House and Senate. This will help me when I win the 2016 Presidential Election. The reason why I am doing this now is because of the vacancy in the U.S. Senate due to the passing of Senator Frank Lautenberg. The election to replace him will be on October 16. Governor Chris Christie has chosen his buddy to be acting Senator until the special election. I cannot wait to tell him he is running for Senate. I will set up his campaign website as soon as he approves and decides to run. Setting everything up now will only mean that he will decide not to run. That’s the way things always work out. I hate working in vain and doing all of the work required to start a campaign only to find out he isn’t interested in running for Senate. I am off to tell him the great news. Wish me luck! I apologize to those of you who thought that this was going to be about me. It’s not. 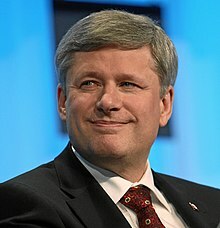 It is about the Prime Minister of Canada, Stephen Harper. Kim Jong Un appears to be dangerous because he talks a lot of trash and backs it up by firing bottle rockets. Stephen Harper is a silent man. His weapons are covert and are not noticed until they have penetrated deeply into American culture. His spy program is unparalleled in the cloak-and-dagger industry. While other countries tend to get their spies to blend in with the general populace, Canadian spies climb to the top of their respective fields. This is most true in the entertainment industry. Why does infiltrating the Great American Entertainment Industry cause a big threat to national security? Because entertainment is the last great export America possesses. Canada has continually diluted American entertainment by sneaking spies like Justin Bieber, Celine Dion, and Norm MacDonald to sneak into the American entertainment industry. It has gotten to the point that American entertainment is beginning to look like Canadian entertainment. The transformation will be complete when poutine and Timbits become staples in “green rooms” across the country. Stephen Harper must be stopped NOW! Most hurricanes stay away from cold fronts. Sandy is expected to make a head-on collision with a cold front currently in eastern Ohio. The air temperature in the days before a hurricane is usually warmer than normal and the air is normally oppressively humid. The temperature has been below normal for the last few days and the air isn’t very humid. The unemployment rate in New Jersey is currently 9.8%. The entire state is expected to be devastated by Sandy. A lot of people will be needed with the cleanup and rebuilding. A classic case of “Broken Windows Economics”. Other “coincidences” include the hurricane making landfall during an astronomical high time. There will be a prolonged saturation of rain and wind in an area that is already oversaturated by recent rains. This will lead to downed trees and power lines, closed roads, and a prolonged period away from the nudie bar. I’m not normally big on conspiracy theories, but I can’t help but think that this is president Obama’s “October Surprise” and that the Cinemafia was instrumental in helping Obama in a diabolical scheme to see that I do not get elected President. The most evil people in government isn’t who we elect, it’s who they select. Most politicians aren’t evil. They are looking out for their futures. Their motivation is money for their re-election campaigns and helping out their “buddies” who helped them get elected. It is these “buddies” who are evil. They are opportunistic and often write the laws that the politicians would pass. One example is the latest soft drink law passed by New York City’s City Council. It was a pet project by Mayor Michael Bloomberg and passed by the Council. The law, which prohibits soft drinks to be sold in open containers larger than 16 fluid ounces in places like movie theaters and restaurants. A customer can still buy 32 ounces of soda, but it has to be in two 16 ounce cups instead of a big gulp cup. The official reason why this bill became law is that it “fights obesity.” If City Council really wanted to fight obesity, they would have also banned larger sized bottles of soda. They could have banned Twinkies. They could have mandated exercise. They didn’t. There is more to this law that meets the eye. People aren’t going to movies as often as they used to. The Cinemafia has to recoup their losses somehow. People are already complaining about the prices of soda and popcorn in concession stands. They can’t just quit selling large sodas on their own – it’s too unnatural. So they talk to their local City Councilperson as a “concerned citizen”. They claim that people are getting obese because of large soft drinks at movie theaters and at restaurants. They include restaurants as a guise because restaurants are dead against such a law and the Cinemafia doesn’t want to give the appearance that they will be the only people to benefit from the new law. How does the Cinemafia benefit from this law? They benefit by getting more money for soda without raising prices. A 16-ounce soda goes for about $4.00 while a 32-ounce goes for $5.00. By emphasizing that the new law allows customers to buy two 16-ounce sodas instead of one 32-ounce soda, they can charge $8.00 instead of the $5.00 they currently get for 32 ounces. This bill will not combat obesity. It won’t stop customers from getting obese nor will it do anything to slim the wallets of the Cinemafia. The next time you hear that someone is a “concerned citizen”, find out why he or she is so concerned. The rumor I am hearing from supporters in Charlotte is that the reason why President Obama’s nomination speech was moved from Bank of America Stadium to the Time Warner Cable Arena is because over 1,000 of my supporters were able to get tickets and they were going to let their voices heard tonight. They were also able to sneak “Ahmnodt Heare for President” signs into the stadium and had them in storage at the stadium until a Democratic Part operative spotted the signs during a security walk-through. They caught a supporter impersonating a security worker try to put more signs into storage. That supporter then spilled the beans about the operation. Most of them had their tickets between the 20-and 40 yard lines on the far half of the field from the stage. They were ready to chant “AHMNODT HEARE!” when the Democratic faithful would chant “FOUR MORE YEARS!”. They even said they were trying to hack into the stadium television screens to have my picture posted while President Obama made his speech. I had no prior knowledge of the actions of my supporters nor do I tolerate breaking of laws to get the message across. Make no mistake about it, I am nonetheless deeply flattered. There are two reasons why this wasn’t mentioned in the news: The first reason is because the media doesn’t want to give my campaign any publicity. If the news ever mentioned that there was a candidate besides Obama and Romney running for President, people would be typing in that candidate’s name in search engines. People have heard of Roseanne Barr, but most people didn’t know she was running for President until they typed her name in a search engine. She and Cindy Sheehan are running on the “Peace and Freedom” ticket. For those of you who found this blog entry by typing in “Roseanne Barr”, “Cindy Sheehan”, or “Reince Priebus Drunk”. welcome to my website. Be sure to check out my platform, videos, and the celebrities who have endorsed me. September 6, 2012 Posted by Ahmnodt Heare | Ahmnodt, campaign, Democrats, election, endorsement, humor, media, Obama, Platform, politics, satire, scandal	| Bank of America Stadium, chants, Charlotte, Cindy Sheehan, media blackout, operatives, Peace and Freedom Party, Roseanne Barr, search engines, security, signs, Time Warner Cable Arena | Comments Off on Ahmnodt Heare! Ahmnodt Heare!